Children ages K5 -12 years old enjoy fun-filled afternoons with visual and performing arts activities, guest artists and special projects. Join us on the first Saturday of each month (excluding holiday weekends), from 1-3 p.m. 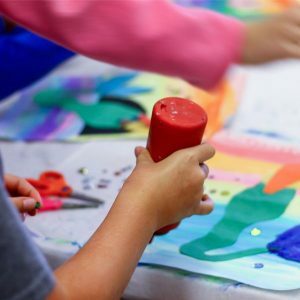 Participate in fun activities for preschoolers ages 2-5 years old, held on the 2nd and 4th Friday mornings of each month (excluding holidays). 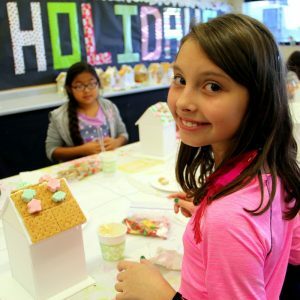 Activities are centered around a current Museum exhibition, a famous artist or a seasonal or cultural celebration. Includes story time and participants may bring a light snack. Visionarios is sponsored by Flint Hills Resources and presented by the Art Museum of South Texas. 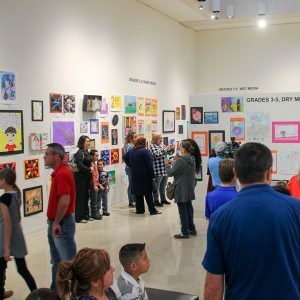 The annual competition is for young artists in grades 1-12 in the Coastal Bend area. Individuals may enter with their parents’ help. Categories include wet media, dry media, digital and photographic media. 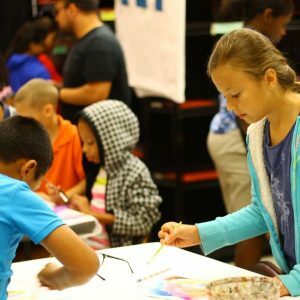 Students’ artwork is exhibited in the Art Museum galleries, and the winners and their families are recognized at an annual awards presentation and Family Day. Typically held on the second Saturday of each, children ages K5-12 years old enjoy an hour and a half studio art class, to explore a variety of art media and techniques such as drawing, painting, collage, sculpture and photography. Held during the school year for ages K5 -12 at the Antonio E. Garcia Arts & Education Center and in collaboration with the College of Education and the Food Bank of Corpus Christi, this program provides tutoring, visual and performing arts activities, health, nutrition, exercise classes, as well as hot meals twice a week for children attending neighboring schools of the Center. 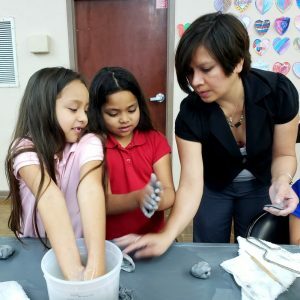 For more information about the Arts After School program, please call 361-825-3600. 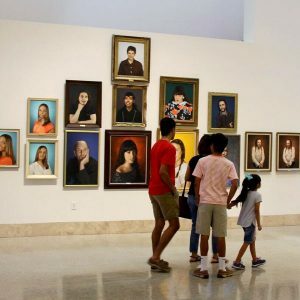 On select Sundays, parents are invited to bring their children to the Art Museum for a free afternoon of art activities, music, live performances and a chance to view the various exhibitions. 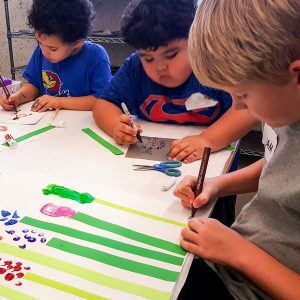 For ages K5-12, our popular summer art camp sessions are offered from 9 a.m. to 3:30 p.m. over a six to seven-week period in June, July and August. 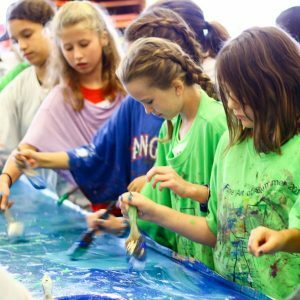 Campers are instructed in a variety of visual and performing arts activities such as drawing, painting, printmaking, ceramics, pantomime, improvisation and musical theater. On the final day of each camp, an exhibition of the work produced and a public performance is held for families and friends. Thanks to the Coastal Bend Community Foundation, we have provided a limited number of camp scholarships for the past three years. Coming soon! Children ages K5-12 will enjoy a week-long session of fine art, drama and fun! Check back next year for 2020 dates. Children ages K5-12 will enjoy week-long series of festive holiday projects and creative drama activities the week before Christmas. Lunch is provided. *Please note: due to the schedules of area schools, there will not be a holiday camp in 2018. However, please check out the calendar for holiday programming. 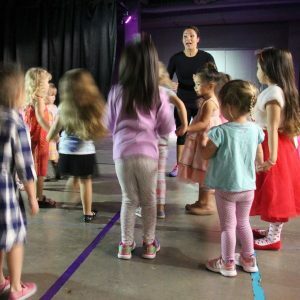 For 4 weeks during the summer, the Very Important Kid Camp provides visual and performing arts experiences for children living in and around the neighborhood of the Garcia Center. Children may also sign up for the afternoon reading camp, coordinated by the College of Education’s America Reads program. 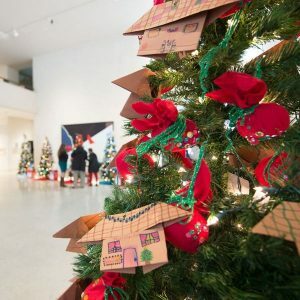 The Junior League of Corpus Christi, H-E-B and the Art Museum come together each holiday season to host the Christmas Tree Forest contest. Area schools are invited to select an award-winning children’s book and create ornaments/decorations reflecting the story for their tree. The public is invited to vote on their favorite tree through mid-December and the top 3 trees are awarded prizes from H-E-B. School groups may tour the Christmas Tree Forest and a free Holiday Family Day and Open House is held in early December. All trees are donated to families in need in the area shortly before Christmas Eve.